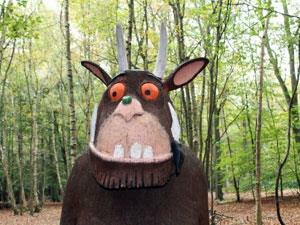 Gruffalo Trail at Thorndon Country Park01277 211250workGuided TourDiscover the magic of the Deep Dark Wood with this self-led trail searching for the amazing hand-crafted carvings of Gruffalo characters. Starting at Thorndon Country Park, the trail is set within it's beautiful woodlands. Discover the magic of the Deep Dark Wood with this self-led trail searching for the amazing hand-crafted carvings of Gruffalo characters. Starting at Thorndon Country Park, the trail is set within it's beautiful woodlands.